Ashleigh Scully probably doesn’t realize the power she commands, though others do and they regard her as a prodigy. Scully uses her hands and eyes to shape how large masses of people feel in their hearts about nature, inspiring viewers five times her age. What she does behind the lens is magical. 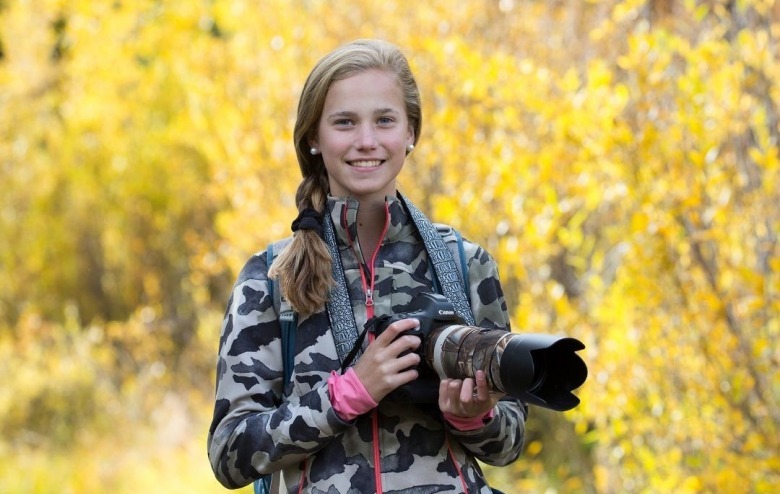 Even in an ecosystem like Greater Yellowstone that annually attracts legions of wildlife photographers from around the globe, and where the professional standards are high, this teenager has already amassed a remarkable portfolio as a wildlife photographer. Indeed, Scully has earned respect from award-winning shooters who do not dole out praise casually. One of them is Jackson Hole’s Henry Holdsworth. 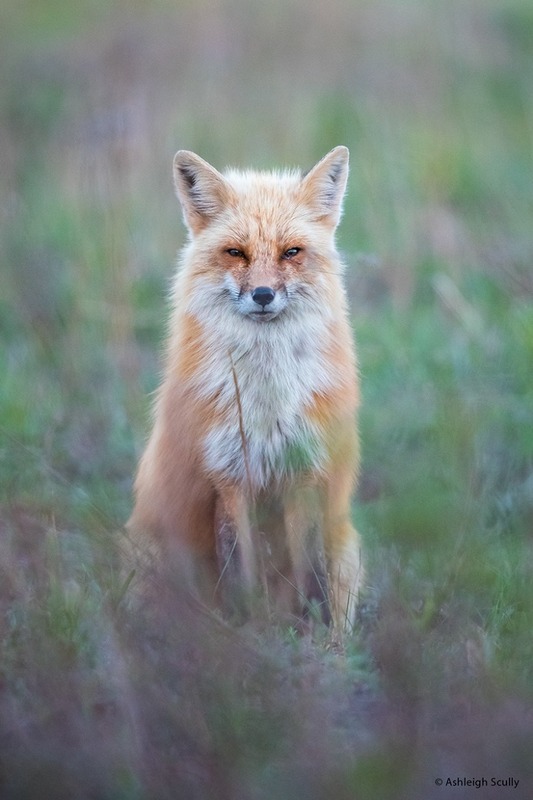 Of this photograph titled "Prince Edward Island Fox," Scully says, "Last summer I joined a workshop hosted by a non-profit called The Canid Project. The Canid Project educates people about wild canids through photography, writing, ecotourism and community outreach. The workshop was held in Prince Edward Island, Canada and our focus was on the many urban red foxes that call this area home. In the back of a store parking lot, there was a mud mound where a family of foxes had their den. Behind it and up the hill was a walking path, and behind that was another fox den. I broke off from the workshop group when I spotted this red fox vixen hunting in a field. After photographing this girl for about an hour, I headed back to the group to give her some peace. As the light started to fade, I walked back up the hill one last time to see if she was there, and sure enough she was, sitting still as if she were waiting for me. I quietly sat down in the grass and balanced my lens on my knees, changing to a vertical composition. She sat patiently as I clicked away. This was one of the most peaceful and humbling experiences I have ever had with a red fox. This summer I will be co-leading a workshop for teens there, and I hope to see this beautiful vixen again." While Scully has a “vision for good, clean compositions” and produces memorable portraits of charismatic megafauna, Holdsworth says she possesses a knack for communicating the spirit of smaller animals, including red foxes and owls. “I call her my ‘owl whisperer’ because owls always seem to find us when she is with me,” he notes. Now in the ascent of her career, as she ponders college, Scully also has attracted admiration from women already standing on the summit of 21st century nature photography, Melissa Groo and Morgan Heim. They know the struggle, not only of earning credibility one image at a time, but the challenges historically that have faced talented women. 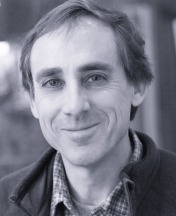 Groo, an Associate Fellow with the International League of Conservation Photographers, writes a bimonthly column on wildlife photography for Outdoor Photographer magazine and is a contributing editor to Audubon magazine. Her work, notably, is represented by National Geographic Image Collection. “I think Ashleigh's work is first-rate. It's a powerful blend of technical skill, aesthetics, and natural history. It's been such a joy to watch her talent mature and deepen,” she says. We asked Groo about the elements necessary for achieving success. “It depends what you mean by succeed. If you mean succeed in terms of national/international recognition, and accolades and awards, then Ashleigh has certainly succeeded. She also has proven successful as a supporter and fundraiser for conservation efforts, of animals from cougars to foxes. These days, in general, to get very far in wildlife photography, you need a strong understanding of your subject, an ethical approach, and a grasp of the principles of fine art. I think she has all these qualities. She also has a very supportive family and community, which have really helped to bolster and further her success." Born in 2002 and set to graduate from high school in 2020, Scully is showing by example that Millennials can use more than their voice to make an impact. She's left little doubt where her evolving convictions reside. 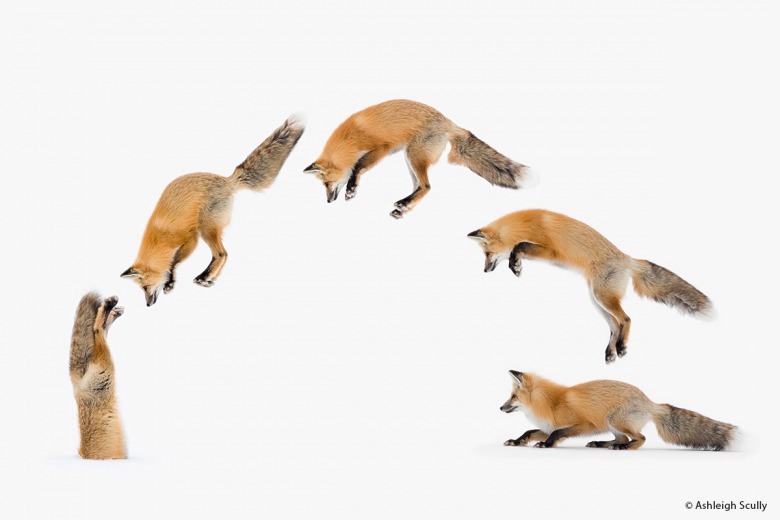 While still in junior high, she allowed the Jackson Hole-based organization that Lisa Robertson founded, Wyoming Untrapped, to use one of her fox images titled “Mom’s Home.” “She wanted to share her photography so more people would realize that animals can show emotion, and when viewers understand that, they may choose to treat them with more respect,” Robertson says. Scully has won prominent awards for her photography, she is a published author of nature books featuring her images, she's a champion equestrian, and she's the official spokeswoman of an organization founded by photographer Suzi Eszterhas called "Girls Who Click" devoted to making nature photography a catalyst for conservation among girls and young women. Groo points to a paradox. While the work of women photographers is steadily gaining greater visibility, the rise of digital social media actually makes it more difficult to break through the clutter and shine. Observes Ashleigh Scully: "This image of a coastal brown bear sow and her spring cub was taken one June afternoon at Lake Clark National Park in Alaska. I witnessed a lot of unique behavior among the resident bears at this park, including this mother and her two cubs. This image was honored as a runner-up in the 2017 Wildlife Photographer of the Year competition in the 11-14 year-old category, close behind the winner, which was a red fox image that I took. 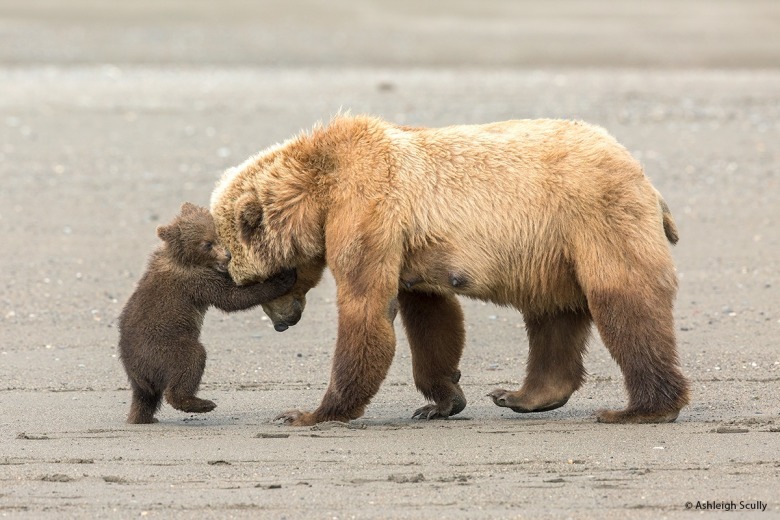 In this image, the mother brown bear was wrestling with one of her cubs, play-fighting on the beach after a session digging up clams in the soft tidal mud. While the mother is likely teaching her cub how to be strong and tough, it is hard not to notice the affectionate nature of the embrace as well. I was so glad to have witnessed this scene, as it changed my perspective on bears forever." Morgan Heim, like Groo, is among a bold new generation of women nature photographers and photojournalists, bringing a different way of seeing. She has nothing but praise for Scully. “Ashleigh's work is technically strong, but that's not what makes her photography succeed. Technical mastery is perhaps among the easiest aspects of photography to achieve. What makes Ashleigh's work so special is the empathy that positively exudes from her images. She has an eye for the moment, an alertness for the relationships among animals, so that her images both tell stories and build relationships between viewer and subject,” Heim says. Heim has paid her dues, taking no shortcuts. She too is a Senior Fellow with the International League of Conservation Photographers and former board member of the North American Nature Photography Association. She has numerous photo and writing credits to her name in major magazines. Enjoy the Mountain Journal interview with Ashleigh Scully. MOUNTAIN JOURNAL: What is your earliest recollection of when you realized photography can leave people transfixed and that it involves more than simply harvesting a picture? 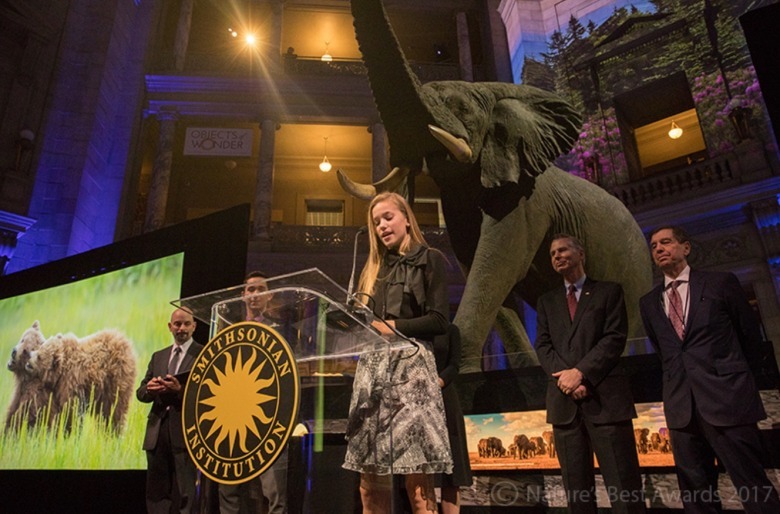 ASHLEIGH SCULLY: My earliest recollection was probably when I went to the Por El Planeta International Conservation Photography Awards ceremony in Mexico City in 2015. Paul Nicklen and Cristina Mittermeir judged the competition, and I won my age category and had a few honorable mentions as well. There were many outstanding photographers awarded at the ceremony so I got to meet and talk to many people. I didn’t know much about conservation let along conservation photography, but learning from Paul Nicklen, Cristina Mittermeir, and Steve Winter really set the stage for the kind of photography I wanted to pursue. They helped me understand that this kind of photography is a way of giving back to the subjects by helping to spread awareness about a species status or plight. This is the real power of an image, I think. Conservation photography can inspire people to make change, and may also encourage the younger generation to get involved in an issue. MOJO: When you talk to your friends and others your age about your passion for photography, how do you explain it? ASHLEIGH SCULLY: Honestly, many of my friends still don’t quite understand what I do. To make it easy for them, I explain that I photograph wildlife to motivate and inspire people to help spread awareness. MOJO: And how about the conversations you have with other young photographers? ASHLEIGH SCULLY: When I talk to my young photography peers they definitely understand my focus, and many of them pursue the same conservation-focused passion. I have had some amazing experiences with like-minded young photographers, whether its tracking down snowy owls along the dunes of the New Jersey shore, searching for Great Gray Owls deep within British Columbia aspen forests, or patiently awaiting the moment a black bear cub raises its head from a nap on a tree limb. Sharing these experiences with other young photographers makes me feel like I am part of a team. It’s nice to not have to explain my interest in photography when I’m with these friends - they get it! At the same time though, I always get excited to talk to anyone about wildlife photography, especially because someone always has a story to tell, and I am all ears!! 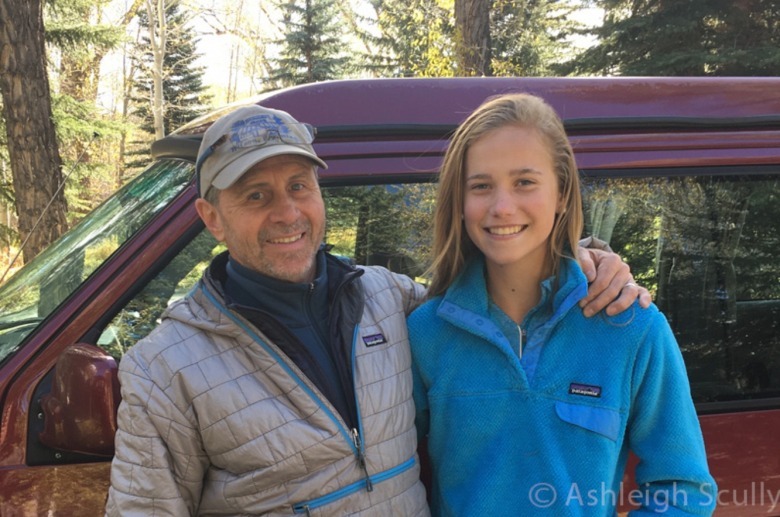 Ashleigh Scully says, "At the age of 14, I went to Yellowstone National Park with my mentor Henry Holdsworth in search of the famous Madison River bobcats. With no luck for the second year in a row, we devoted our time to searching for wildlife near the Lamar Valley. After a slow morning, my eyelids began to get heavy and I found myself drifting off. Just before I fell asleep, something red caught my eye against the white snow. A beautiful red fox was trudging its way through the snow, and stopped right across the road from our car, positioning itself for a perfect perpendicular pounce. I scrambled and grabbed a bean bag to balance my camera on and simply waited, my heart beating out of my chest. Every other opportunity I’ve had with pouncing foxes I’ve missed the shot. I positioned the fox in the bottom right corner of the frame and waited for it to jump. It tilted its head back and forth, listening for voles and mice in the snow beneath. Finally it jumped, and I was prepared, firing off a quick burst of shots. I managed to recompose and capture some interesting images of it half-buried in the snow, too. I think this image demonstrates the harsh conditions that these animals may face in environments like Yellowstone, and the unique skills they’ve adapted to survive." MOJO: Tell us about where you grew up and momentous events that gave you a fascination with nature? ASHLEIGH SCULLY: Most people think I live in Wyoming because of how often I am there but I was born and raised in New Jersey, and I still live there. New Jersey may not seem like the ideal place when it comes to photography, but my backyard became a key factor into my growing love for photography. My love for foxes and owls developed through the rural area of New Jersey that I call home, from my backyard to the wildlife refuge five minutes down the road. But as most know it all started when I was 8 and my grandparents gave me a camera for my birthday, and we proceeded to go on a family trip to Alaska. The diversity of wildlife made me fall in love with Alaska, and I have been back twice since. MOJO: How did the vacation up north convince you to become an artist? SCULLY: During this first trip to Alaska aboard the National Geographic Sea Bird, I had the first of many wildlife encounters which would change my life. As our ship neared shore at one of the national parks, the guides spotted a humpback whale carcass that the bears and wolves had been feeding on for the past couple of months. It was far off the distance on the shore. I waited for what seemed like hours, until a scrawny teenage grizzly wandered towards the carcass and began to feed. We spent the next hour or two watching this bear scare off a black bear and a wolf, defending what was left of the whale. Although my small Olympus point-and-shoot camera didn’t zoom too far, I was determined from then on to get better photos. That’s really how it all started for me. MOJO: What role has coming to Jackson Hole played in your auspicious career as a nature photographer? ASHLEIGH SCULLY: Jackson Hole has definitely played a very significant role in my young career as a nature photographer. My family started traveling to Jackson as a ski destination, and it didn’t take long for me to discover the incredible amount of diverse wildlife that live in the area. Pretty soon I was skipping a ski day to go out into Grand Teton National Park and shoot. I feel like I already have a lifetime of incredible experiences in the Jackson Hole area, simply because of the many places there are to shoot, and also because it seems like any day can present the most awe-inspiring moments. I have also met many photographers in the Jackson area who have been so supportive and helpful. ASHLEIGH SCULLY: One of my biggest mentors, Henry Holdsworth, has played the most significant role in my improvement as a photographer, especially out there. Over the years he has guided me in the conservation field as well as helped me develop my own style. I am forever grateful to him. MOJO: What kind of a mentor has he been? ASHLEIGH SCULLY: I have known Henry Holdsworth since I was 10 years old. I walked into his gallery in Jackson Hole and was blown away at all of his inspiring photos from places like Africa, Alaska, and mostly, Jackson Hole and Yellowstone. He happened to have been working at the gallery that day, and with little experience in photography but with hope, my mom brought me up to the front desk to introduce me as a fan and an aspiring photographer. MOJO: It was Henry who helped convince you that you needed to return to Alaska, yes? ASHLEIGH SCULLY: In June of 2016, I attended Henry’s photography workshop up in Lake Clark National Park, Alaska and had the most unforgettable experience of my life. Alaska is the place that sparked my love for photography, and to spend a week out there with brown bears, along with watching and photographing their behavior was more than I ever dreamed I’d be doing. Over the years Henry has opened my eyes to the world of photography. I owe a lot of my knowledge in the field to him and I am so thankful for that fateful day when I walked into his gallery. He has been a great friend ever since. You don't have to travel around the world to find the wonders of nature. 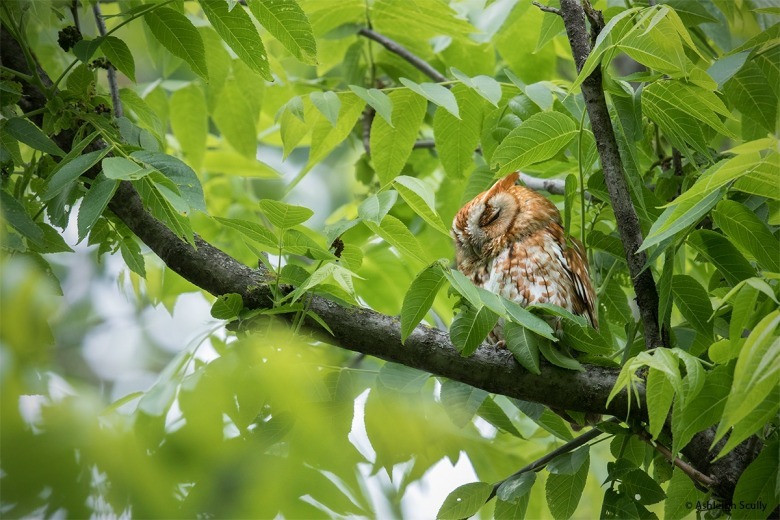 As Ashleigh Scully reminds, offering this description for how she captured the image, "Sleeping Screech:" "Eastern screech owls are one of my favorite photography subjects here in New Jersey. On winter days I can find them resting in tree cavities along the country roads. I photographed this rufous eastern screech owl from a treehouse in my backyard two summers ago. My dad and I had placed a screech owl nest box in the woods behind our house, hoping that a screech owl pair would use it. That summer, this particular nest box was successful, and 5 screech owlets were raised by a determined adult pair. The rufous morph, or red screech was the male. He would roost high in the tree canopy during the day, always in a spot from which he could watch over his family in the nest box below. This is one of my favorite owl photos simply because I helped to provide a home for his family. Too many people cut down tree snags or stumps with cavities - the exact places that owls need to safely nest. There is a lot you can do in your backyard to help the wildlife around you!" MOJO: Tell us about family support for your photography? ASHLEIGH SCULLY: My family has been very supportive of my photography since I started. Their understanding of my dreams and goals is something I am so grateful and thankful for. Both my parents do equally amazing jobs by chaperoning my trips in the field. My mom was with me in Africa, and my dad was with me in Alaska, and they have both been with me for award ceremonies. My dad had played a huge role in helping me understand the basics of photography but he too has also learned from all of my mentors and guides and helps me through things everyday. He had a strong knowledge of file management and has helped me learn the computer/technological aspects of photography, the kind of “backstage” part you could call it. My whole family together has been nothing short of amazing. I love all of them so much and I don’t know where I’d be without them on this journey. MOJO: What other shooters inspire you—and why? SCULLY: There are many but here are just a few: Henry, Cristina Mittermeier, Paul Nicklen, Steve Winter, Tin Man Lee, Melissa Groo, Connor Stefanison, Jess Findlay and Morgan Heim. MOJO: Nicklen is renowned for his Arctic photographs and Mittermeier for marine and tropic work. Plus they were instrumental, as Jackson Hole’s Thomas D. Mangelsen was, in establishing the International League of Conservation Photographers formed to promote ethical standards in nature photography. How would you describe the influence of Paul and Cristina. ASHLEIGH SCULLY: They impacted me at a young age. I had followed their work for years and when I arrived in Mexico City in 2015 I couldn’t sit still because of how excited I was to meet them. They had a huge influence, introducing me to conservation photography, and Cristina has definitely played a huge role because she is a female photographer. Her work and drive to inspire younger girls has motivated me to do the same. MOJO: Does it impress you that they are also a couple? ASHLEIGH SCULLY: They have this incredible ability to bring people together to raise awareness about subjects through their talks, imagery and social media work. They do so much good for the world and travel to the most beautiful places and there is nothing more I would love than to tag along with them one day. They are both hands-down the most humble, hard-working, dedicated and down to earth people I have ever met and I will forever look up to them. ASHLEIGH SCULLY: Steve Winter was a big inspiration to me as well during the Por El Planeta photography awards. He was so willing to talk to me and share his stories and I learned so much about camera trapping from him. His experiences with big cats and all of his crazy adventures helped to shape my own dreams, and inspired my interest in Jackson’s local mountain lion population. I have seen him briefly a few times since and I hope to see him again sometime soon. After following each other for years on social media, I finally got to meet Tin Man Lee at the 2018 Nature’s Best Windland Smith Rice Awards in Washington D.C. this past November. Tin Man is one of the most talented wildlife photographers in the world. He was so humble and kind, just as others had told me. His patience inspires me because he never seems to give up, not even in the most extreme conditions. He is also a master at pre-visualizing the shot, and works extremely hard at making his vision a reality. He is a huge inspiration of mine and I can’t wait to continue learning from his photography. The chance to create this image, "Pine Marten," presented itself quite unexpectedly. "Last winter over the course of a few days, my family had a surprise visit from an American Marten at our home in Jackson Hole," Scully says. 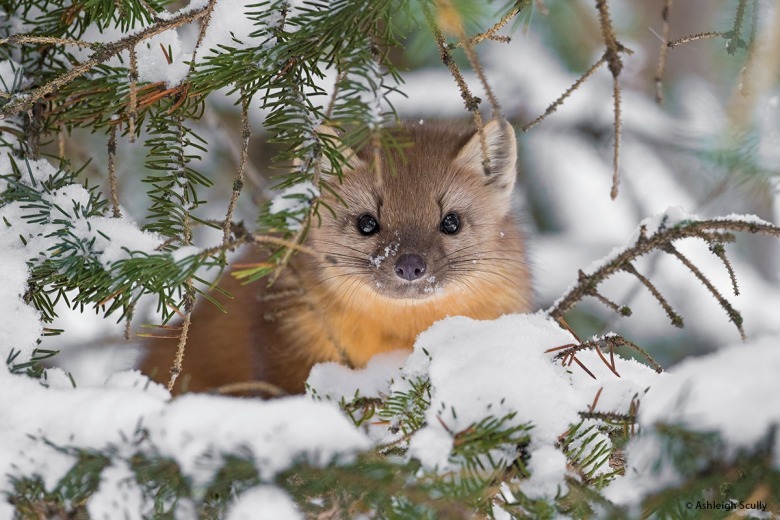 "The marten was extremely curious, and enjoyed running around the yard from cottonwood to cottonwood, sweeping off the snow drifts from the bark, searching for cavities where a tasty red squirrel snack might be hiding. Each morning I had my camera and lens ready on a window sill and we each peeked out of the kitchen windows, hoping the marten would make an appearance. At one point, it climbed into a spruce tree by our back desk and laid flat in the crook of a tree branch and closed its eyes for a nap. I quietly went outside in pajamas and boots and took some photos of it resting. This image was taken as it lifted its head to inspect me, as if I was the strange one to be seen that day! This remains one of my favorite wildlife encounters and experiences in Jackson Hole." MOJO: How did you become acquainted with Melissa? ASHLEIGH SCULLY: Melissa Groo is a very well known and respected female wildlife conservation photographer that I consider to be a great friend. We met after I emailed her when I was about 10. She has helped to guide me along my current path through encouragement and inspiration. She has been kind, generous, understanding, and motivating I really wish I saw her more. Melissa and I have been through a lot together. We’ve chased serval cats in Africa, red foxes in my backyard and Great Grays in Wyoming. She also was an enormous support to me during our co-presentation several years ago at the Jackson Hole Center for the Arts for Wyoming Untrapped. Whenever I am around her, I can be my true self and I cannot thank her enough for all she has done for me. She is my hero. MOJO: You like some of the Canadian shooters, too, yes? ASHLEIGH SCULLY: Connor Stefanison and Jess Findlay are two young award-winning nature photographers from British Columbia that I have met and photographed with, They are really fun guys to be around and incredibly knowledgeable about photography. They have very artistic and creative eyes and are devoted to many hours in the field in any condition. They are so extremely patient and hardworking and excel at what they do. I have looked up to both of them for years and I am so thankful for our amazing experiences together. I am proud to call them both my friends. MOJO: Last but not least, you also hold Morgan Heim in highest regard. Tell us about your relationship with her. ASHLEIGH SCULLY: Although I haven’t known Morgan as long as most of my mentors, she had a huge impact on me at the 2017 NANPA High School Scholarship Program in the Great Smoky Mountains. Morgan was one of the guest instructors during this workshop. The story she spreads through her work and her dedication to conservation are very telling through her photos. I am mostly inspired by her project with roadkill, where she will place flowers around a deceased animal and document its story. It is one of the most moving projects I have ever seen and it left a big impact on me when I left the Great Smoky Mountains. I look forward to learning more from Morgan in the future. MOJO: Your voice is being recognized—not only the visual language you speak but you’ve been invited to different kinds of forums. What are your goals? ASHLEIGH SCULLY: My ultimate goal is to inspire the younger generation to change any negative perspectives on wildlife and help spread awareness for conservation, along with inspiring girls and women. My short term goals are the steps I need to take to get there. Giving talks, awareness through social media, workshops, and writing blog posts. MOJO: You’ve made an auspicious start. With so much of your life still ahead, what’s next? ASHLEIGH SCULLY: Photography is definitely something I want to do. There is still so much to learn and experience and that eager feeling sits with me every day. Although I’m not 100 percent sure where the road of conservation photography will take me in the next few years, I am excited to find out. 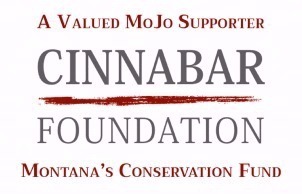 EDITOR'S NOTE: This story is part of an ongoing series called "Those Who Faced A Challenge And Did The Right Thing," with research underwritten in part through a grant by The Cinnabar Foundation.